The Viking King Guthrum ruled the Danelaw (northern England) and parts of Mercia and Northumbria in the late-ninth century. 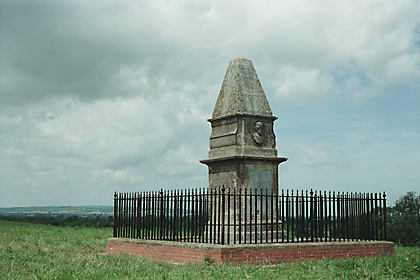 He then set his sights on the Anglo-Saxon Kingdom of Wessex, ruled by Alfred the Great. Guthrum and his Vikings made a presumably surprise attack on Alfred’s castle at Chippenham on Christmas, January 6, 878. 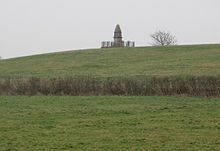 Alfred was forced to flee with his family (including his eldest daughter, Aethelflaed to safety in the woods and eventually made his way to the island of Athelney (Prince’s Island) in the marshes of Somerset. Originally this small island was covered with alders and infested by wild animals. According to the 12th C. chronicler William of Malmesbury, it was inaccessible except by boat. Archeological excavations and written chronicles indicate in Alfred’s time the island was linked by a causeway to East Lyng. Both ends of the island were protected by a semi-circular stockade and ditch. The ditch on the island has been dated from the Iron Age so Alfred may have known of this ancient fort when he chose to take refuge there. Alfred began strengthening these ancient defenses. There is evidence of metalworking on the site suggesting he may have also used his time here to equip his army. Alfred spent four months there contemplating how to defeat the Vikings and waging guerilla warfare against Guthrum. He decided he wanted to unify and bring together all the kingdoms of England and called his men together at Egbert’s Stone. Alfred and his army soundly defeated Guthrum’s Vikings at the Battle of Eddington in May of 878. The victory resulted in the Treaty of Wedmore which established boundaries for the Kingdoms of Guthrum and Alfred. Of even greater significance, Guthrum agreed to become a Christian, taking the name of Aethelstan with Alfred as his godfather. The conversion of Guthrum to Christianity meant he had taken a solemn oath to honor the peace treaty, making its significance more political than religious. Alfred Should be England’s Patron saint . He initiated the concept of England. I am curious: is anyone aware of a study (or research) that may indicate how many of us in the U.S. and the U.K. are descendants of Alfred? I’m not aware of any research Jeffrey but it’s a very good question. Thank Niall. Just discovered your blog. Looks like we share an interest in all thing medieval! Very nice Susan = The “Time Team” crew did they first programme on the Isle of Athelney but without any digging. They later returned for another programme with digging. I think both programmes are available on Channel 4 website called 4od.